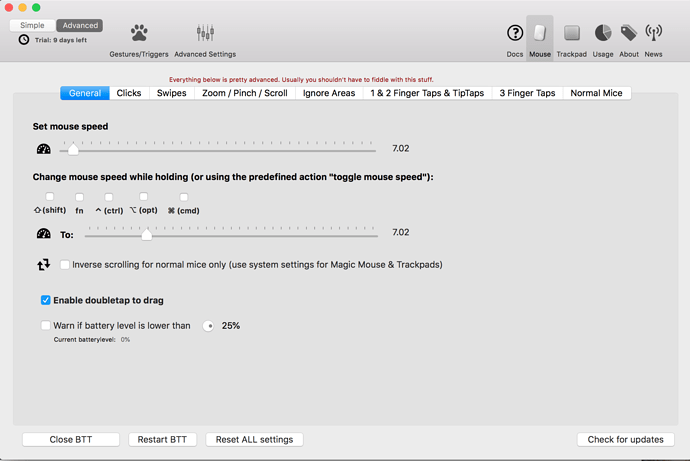 I set the BTT to change the mouse tracking speed when I press the key fn+m (via the keyboard tricker). In the advance setting of mouse, I set the normal tracking speed to 1 and another tracking speed to 7. BTT seems to work properly when I press the key fn+m. However, after a while, BTT automatically sets both tracking speed to the same values (see attached image), so when I press fn+m, the toggle mouse speed function does not work at all. Another issue is that when I set the normal and faster tracking speed for mouse (in advance setting), the tracking speeds for the trackpad (both normal and faster ones) are changed also. It seems that I cannot set the normal and faster tracking speeds of mouse and trackpad separately. Just update BTT to 2.660, and also face this issue.